Vulcan Strength Training Systems: Keep Your Hands on the Bar! Keep Your Hands on the Bar! A detail of weightlifting technique not often discussed is to keep your hands fully on the bar in a clean as you turn it over and put it on your shoulders. This will help the lifter meet the bar smoothly and stay tight as the weight drives them into the hole. I am not necessarily talking about keeping the hook grip all the way to the rack position. It is okay to let the thumb pop out when turning over the bar, but the hands should stay closed on the bar, the palms still in contact with the bar. Why does this matter? When you open your hand and loosen your grip on the bar, you lose “contact” with it. You don’t have the feel of precise interaction with the bar, so you cannot feel the precise location of the bar and your body in relation to each other. Given that your job when moving under the bar is to meet it as precisely as possible and be tight against it as it tries to drive you down, it is unwise to lose control of it. You have to know where the bar is in space, be able to feel where it is, to meet it smoothly. To do that as well as possible, you need to keep your palms on the bar. While he is a little late getting under the bar, by opening his hands he exacerbates the problem. We’ve already started working to correct this. I can already hear the complaints that, “I don’t have the shoulder or wrist mobility to do that!” Most of the lifters saying this have given half a try at getting the necessary mobility to keep their hands on the bar, but only that. It doesn’t come easily or quickly, often taking months to achieve the position, and requiring constant maintenance to keep it. If you want to be the best lifter you can be, do it. The stretches and mobility exercises that help are common knowledge in most weightlifting gyms, but persistent effort on them is not at all common. One simple way to help get and keep the required mobility is to front squat with hands closed on the bar. 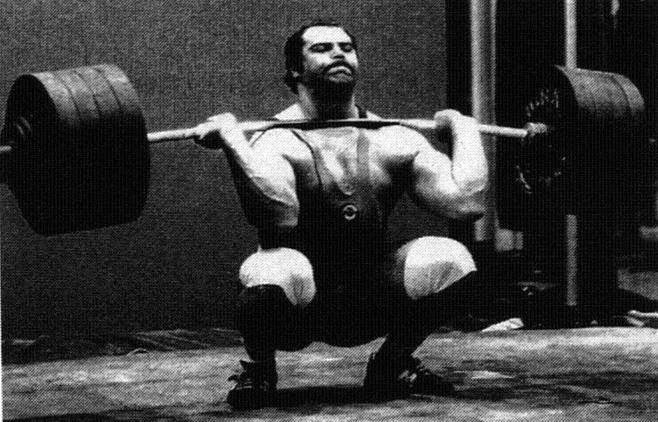 Your front squat may go down at first, and it can be mildly painful. Do it anyway. Working on the mobility to keep your hands on the bar will be far more productive than running to your laptop to hunt down great lifters who don’t keep their hands on the bar. You’ll find some. They won’t help you clean more, though. Keeping your hands on the bar will. Check out the range of Olympic Bars at Vulcan!